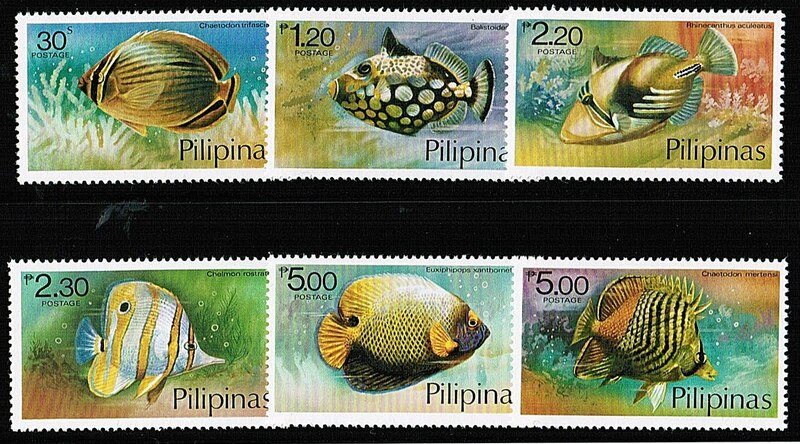 In 1978, the Philippines issued a colorful Fish set (Scott #1379-84). Only 50,000 sets were issued, and Scott '11 values the unused set at $11.00. Most were probably used as postage and discarded. From the perspective of philatelic history, the Philippines is interesting because it has issued stamps under Spanish dominion, U.S. Administration, Japanese Occupation, and as an independent nation. It is also compelling as an area of research for the philatelic investor, because of its rapid economic growth, and because it has issued a number of scarce yet overlooked issues, including some modern popular topical sets, such as the Flora/Fauna topical issue featured in this article. Those interested in joining a community of stamp investors, dealers, and collectors are welcome to join the "Stampselectors" Page at Facebook. 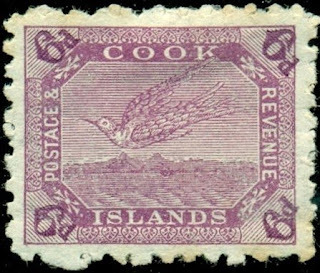 The group provides a useful venue for those who wish to buy, sell, and trade stamps, and discuss philatelic investing and practical aspects of stamp collecting. Among the oddest aspects of religion depicted on stamps was the encouragement of the observance of Sabbath on Sunda y. 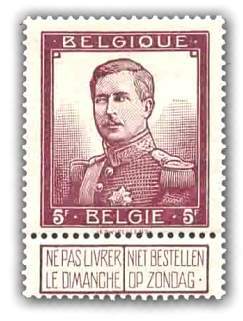 In the late 19th and early 20th centuries, Belgium issued special Sunday Delivery Stamps. Attached to each was a small tab, which could be torn off if necessary, with instructions in Flemish and French that a letter bearing the stamp and tab was not to be delivered on a Sunday. 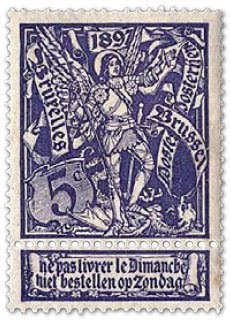 These tabs are found on all Belgian stamps issued between 1893 and 1912. The origin of this instruction is to be found in the Fourth of the Ten Commandments, which commands that the Sabbath be kept holy, and that no work shall be done on it. With the introduction of Sunday postal deliveries in Belgium, objections were raised by some individuals who regarded Sunday as a holy day and strongly opposed this Sunday mail delivery as a defiance of God’s law. However, many Belgians did not mind Sunday delivery at all, so a compromise was reached: if a person posting a letter did not mind it being delivered on a Sunday, he could detach the tab bearing the instruction “Do not deliver on Sunday.” If, however, Sunday deliveries were against his religious beliefs, he could leave the tab on the stamp and his letter would be held over at the post office until the Monday. In effect, the religiously observant were given the opportunity to make a sacrifice for their faith by delaying the delivery of their letters by one day. Of course, the sacrifice probably seemed trivial, as delaying progress and being "behind the times" has not bothered believers very much in the past. 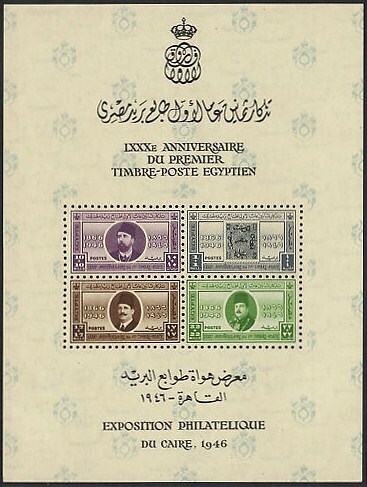 In 1946, Egypt celebrated the 80th Anniversary of its first postage stamp, by issuing a set of four stamps (Scott #B3-6) and two souvenir sheets, in perf. and imperf. form (Scott #B6a-6b). While the basic set is common, only 7,196 of the two souvenir sheets were issued, and Scott '11 prices them unused at $70.00. I recommend purchase of all better stamps from Egypt, as the country is likely to experience rapid economic growth over the coming decades. 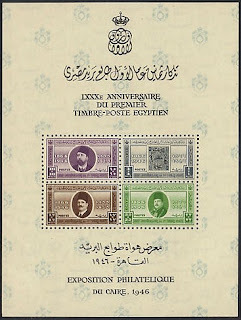 Aside from these sheets' low printing, the 1m + 1m value pictures Egypt's first stamp, and is therefore of interest as a Stamps-on-Stamps topical. With an estimated 76 million people, Egypt possesses one of the most developed economies in the Mid-East, with a GDP growth rate of 5%-7%. Hopefully, its new government will continue the policy of undertaking major economic reforms to further spur development, including massive investments in infrastructure and liberalizing economic and tax policies to encourage foreign investment. Egypt's main challenge in the years to come will be one of social and political democratization - how to assure that enough of the new wealth trickles down to the majority of the population to lessen the problems of poverty and political instability. 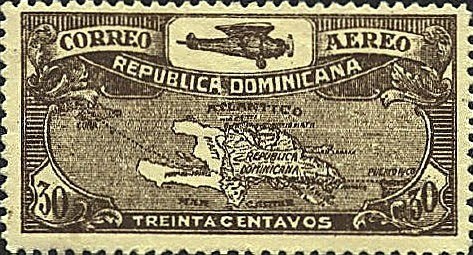 From 1928 through 1930, the Dominican Republic issued its first airmail stamps, featuring a map of the island of Hispaniola (Scott #C1, C2-5, C6-9). 100,000 of #C1, 25,000 of C2-5, and 50,000 of C6-9 were issued, and Scott '11 prices them unused at $17.75 and $13.25, respectively. In all likelihood, 85%-95% of these stamps were used as postage and discarded, which explains why one doesn't run across them very frequently. They're probably several times scarcer than the U.S. Graf Zeppelin set, and with far better prospects of climbing much higher than their current levels. While it may take some time for a significant stamp collecting population to develop among Dominicans, the upside to investing in Latin American stamps is that there is a tendency among collectors to focus on the region as a whole. With a population of about 10 million people, the Dominican Republic is considerably better off than its neighbor Haiti, with which it shares the island of Hispaniola. Though long known for sugar production, its economy is now dominated by the service sector. The country has become the Caribbean's largest tourist destination. Over a million Dominicans now live in the U.S., and they send billions in remittances home to their families, amounting to a tenth of the GDP. Annual GDP growth has averaged around 6.5% over the last 6 years, although it has been uneven from year to year, and unevenly distributed. As in much of Latin America , reforms will be necessary to address governmental corruption and the gulf between rich and poor. 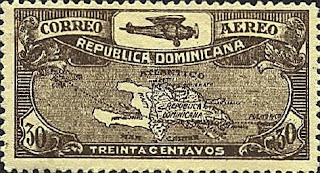 I have begun a new blog, " The Stamp Specialist ", featuring my buy lists for stamps which I wish to purchase, including some Dominican stamps. Periodically viewing dealers' buy lists is an excellent way to remained informed about the state of the stamp market. 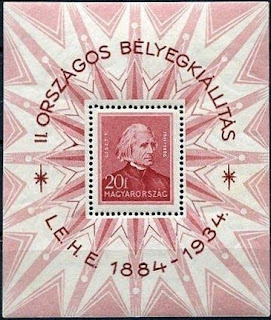 In 1934, Hungary issued its first souvenir sheet, honoring composer Franz Liszt (Scott #486). 50,000 of this Music topical were issued, and Scott '11 prices it unused at $60.00 ($140.- for NH) . 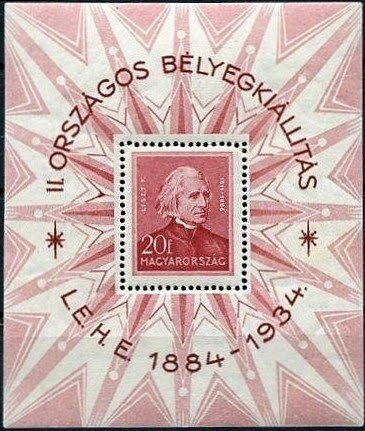 As with many Hungarian issues from the 1920s on, an imperforate version of the souvenir sheet exists, and it is considerably scarcer than the regular issue. While the quantity issued of the imperforate version is not known, I estimate that no more than 5,000 were produced. While recent economic reversals in Europe have hurt the stamp market there, I feel that for most of the countries, the situation is unpleasant but short-term. In the meantime, there are opportunities to pick up bargains, and scarce items with topical appeal are worth considering. After a difficult transition from a centrally-controlled economy to capitalism, Hungary has experienced moderate economic growth until it was impacted by the 2008-09 financial crisis. As a result of the global financial mess, GDP growth has been almost flat over the past five years. As the newest member of the European Union, this nation of 10 million receives nearly a third of all direct investment flowing into Eastern Europe. Agriculture, metallurgy and mining, and tourism are major components of the economy. In 1955, the United Nations celebrated its 10th Anniversary, and many nations issued stamps and souvenir sheets commemorating the event. South Korea issued a set of two stamps (Scott #221-22), which are relatively common, but it also issued a set of two presentation sheets (Scott #222Note), of which only 1,000 were issued. 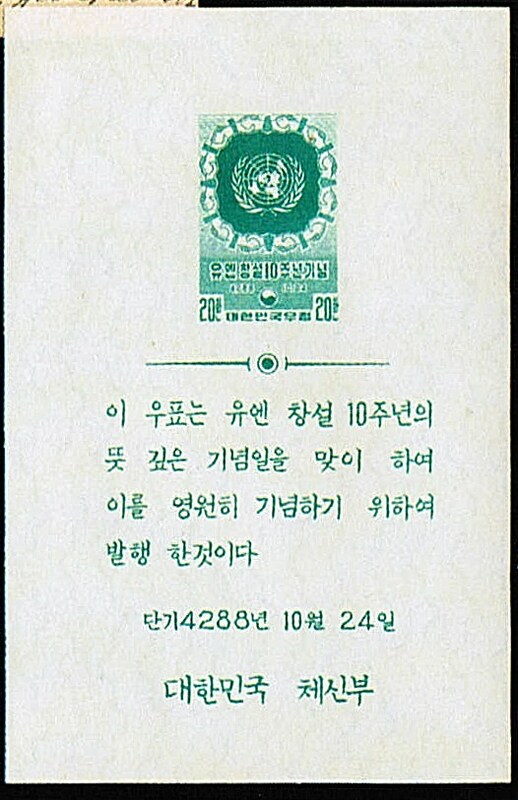 Many stamps of South Korea from the '50s were issued along with these accompanying presentation sheets, which were given to dignitaries. Scott does not recognize most of them, but they are listed in Michel and in the Korean Postage Stamp Catalog, which prices them at 960,000 won, or about $850.-. Because they are usually not listed by Scott, Korean presentation sheets, of which a 300 to 1,000 were produced, can often be bought at U.S. auctions for 25% - 35% of their Michel or KPSC values. Whether or not they remain at low levels will depend upon whether they are widely accepted by Korean collectors. 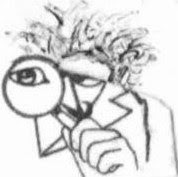 In the meantime, I believe that the most prudent strategy for speculating on them would be to focus on those feature popular topics, such as the U.N.. 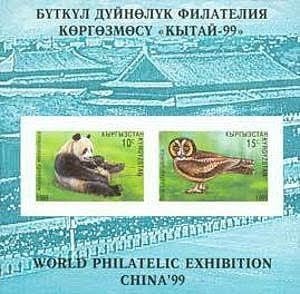 In 1999, Kyrgyzsgtan issued a souvenir sheet picturing a Panda and an Owl in celebration of the China '99 World Philatelic Exhibition (Scott #131). Only 15,000 were issued, and Scott '11 prices it unused at $ 2.25. Aside from being a scarce Animal topical issue, the souvenir sheet also appeals to collectors in China, the biggest and most dynamic stamp market in the world. Focusing on scarce popular topicals is a prudent means of speculating on stamps of the newly independent nations of Central Asia. Whether or not demand develops within these countries for the stamps that they issue, there will always be worldwide demand for their most popular topicals. Issues that are of interest to the tens of millions of Chinese collectors should do especially well. A nation of about 5.4 million,Kyrgyzstan was the second poorest country in the former Soviet Union, and is today, the second poorest country in Central Asia. Kyrgyzstan has had economic difficulties following independence. Initially, these were a result of the breakup of the Soviet trading bloc and resulting loss of markets, which impeded the republic's transition to a free market economy. Overall, the government appears committed to the transition to a market economy.and is seeking to establish a pattern of long-term consistent growth. Agriculture is an important sector of the economy, and the country also has substantial reserves of coal, gold, uranium, antimony, and other valuable minerals. Also, the country's plentiful water resources and mountainous terrain enable it to produce and export large quantities of hydroelectric energy. Annual GDP growth over the last five years has averaged about 3.5%. As a stamp dealer, I'm frequently contacted by collectors who have large accumulations of mint U.S. stamps issued over the last 40 to 70 years. As most experienced U.S. collectors know, the vast majority of these stamps are common, and accumulations are often sold at a discount to face value at stamp auctions. 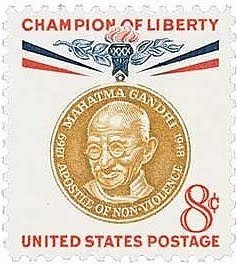 Typically, stamp dealers offer 60% - 70% of face value for such stamps, and then either use them as postage, or try to resell them at 80%-90% of face. 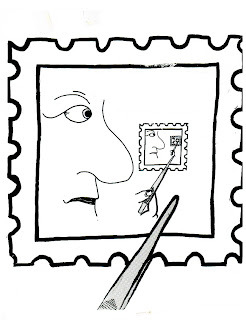 Using the stamps as postage can present an interesting challenge, at it can be difficult to fit enough 3c or 4c stamps on an envelope to make up the first class rate. Over a very long period of time, there is a attrition of supply of these stamps, as collectors and dealers use them up as postage. 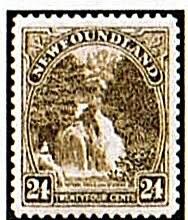 Every 15 or 20 years, a few of the earliest stamps that were formerly considered discount postage take on a slight premium. This has begun to happen for some issues of the late '30s and early '40s, especially if they are in sheet or plate block form. I do not recommend buying huge accumulations of U.S. discount postage and then waiting decades for the stamps to increase in value. However, if one is purchasing an accumulation to either re-sell or use as postage, some consideration should be given as to which are sold or used first, and which are held back. Clearly, a slight premium should be assigned to plate blocks of 4 of the mid-'60s and earlier -those issued before the Postal Service ruined the plate block market by producing sheets with multiple plate numbers. The same holds true for plate number strips and line pairs of coil issues. Another factor to consider when determining whether to favor certain of these stamps is topical interest. Value appreciation can be significantly accelerated by a surge in demand for a particular topic. Two examples of common U.S. mint stamps acquiring significant premiums are the 1938 3c Baseball Centennial stamp (Scott #855; 81 million+ issued; Scott '11 CV as unused = $1.75 ) and the 1942 5c Chinese Resistance Stamp (Scott #906; 21 million+ issued; Scott '11 CV as unused = $1.40 ). #855, and many more recent U.S. Base ball issues, jumped in value in the '80s during the boom in Baseball card and memorabilia collecting. 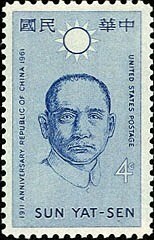 #906 has been pushed up due to its appeal as a Chinese history topical, as supplies of the stamp have begun to be sucked up by the white-hot stamp market in the People's Republic. Both of these stamps were long considered "wallpaper" - indistinguishable from all of the other underperforming issue s produced in the tens and hundreds of millions by the Postal Service, and glutting the market for many decades. Even individual organizations can deplete the supplies of a particular stamp and drive up its price. In 1987, a rather dull 22c stamp was issued honoring Certified Public Accountants (Scott #2361; 163 million+ issued; CV as unused = $1.00). 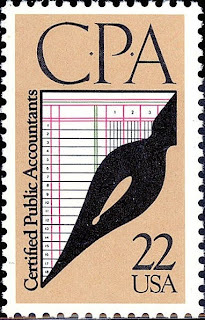 Several years later, a national association of CPAs decided to do a mass mailing using the stamp, and purchased a significant number of sheets by publishing buy ads in stamp periodicals, thereby making an otherwise boring stamp a "hot item." Speculating on extremely inexpensive stamps is problematic, because it's usually necessary to locate, purchase, and store thousands or tens of thousands of each in order to make the project worthwhile. If one does accumulate such a hoard, the speculator may then increase the likelihood of making a profit by advertising a buy price for the stamp, thereby hopefully pumping up the demand for it. The upside to such an project is that, in the case of modern U.S. mint, there is very little risk of loss if it is purchased for face value or less. Assuming that one manages to find enough of a supply of a particular issue, the keys to success are the ability to project which stamps will increase in value due to topical demand, and also making a somewhat accurate educated guess as to how many of the stamps remain. I estimate that for most run-of-the-mill U.S. issues, about 1% -2% of the initial printing quantity remains after 30 years. 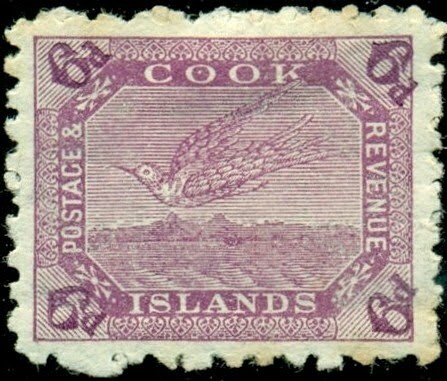 Supplies of such stamps continue to diminish for as long as they are not worth saving. However , a greater proportion may survive if an issue is of more interest than normal. Such "special interest" items include souvenir sheets, certain se-tenant issues, and topicals popular at the time of issuance. There are many inexpensive U.S. stamps issued over the last 70 years which might rise due to their topical appeal. Some that stand out include the 1961 4c and 8c Mahatma Gandhi Issue (Scott # 1174-75; 112 million + and 41 million+ issued; Scott '11 CV as unused = $.20 and $.20 ), the 1961 4c Sun Yat-sen Issue (Scott #1188; 110 million+ issued; Scott '11 CV as unused =$.20 ), and the 1994 $1.19 World Cup Soccer Souvenir sheet (Scott #2837; 60 million issued; Scott '11 CV as unused= $ 4.50). 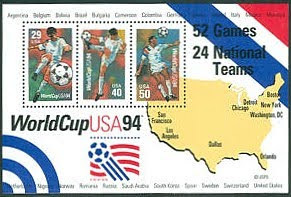 The Soccer Souvenir Sheet, while not strictly discount postage, is a minor premium item, and is frequently be found in discount postage accumulations. Those who like to think outside the box might consider the 1947 3c Utah Centennial Issue (Scott #950; 131 million+ issued; CV as unused= $ .20 ). 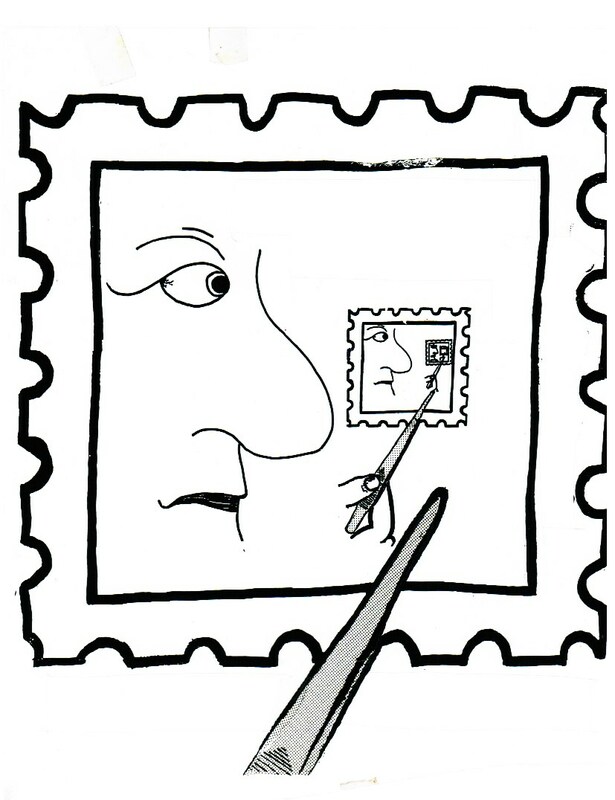 This stamp qualifies as the first and only Mormon Topical. Currently, there are over 12.5 million Mormons in the world, and their number is growing by slightly under 3% per year. It should be noted that 20c is Scott's "minimum catalogue value"- the lowest catalogue value which Scott assigns to a stamp in order to take account of the seller's labor costs. 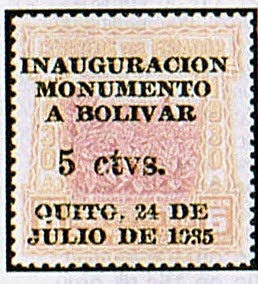 In actuality, the four 20c CV stamps described above are considered discount postage. In summary, supplies of most mint U.S. stamps issued over the past 70 years are abundant, and it is likely that they will remain very inexpensive for many decades more. Our grandchildren's grandchildren may still be using many of them as postage. However, the stamps that have growing topical appeal will tend to increase in value the fastest, and may be set aside (or used last), or even considered for accumulation by those who with sufficient patience and persistence to hoard them. Labels: Practical Advice, Topicals, U.S.
From 1907-10, Southern Nigeria issued a definitive set with a portrait of Edward VII (Scott #32-43). 20,520 sets were issued, and Scott '11 values the set unused at $403.75. Stamps of Southern Nigeria have the potential for dual market appeal among collectors of British Commonwealth and Nigeria. In an earlier blog article, I discussed a Price, Waterhouse report projecting which countries' economies would grow the fastest over the next 40 years. Nigeria's came in third. A nation of over 154 million people, Nigeria is an an emerging market country, and is rapidly approaching middle income status, with an abundant supply of resources, well-developed financial, legal, communications, transport sectors, and a stock exchange which is the second largest in Africa. It is the eighth largest exporter of petroleum in the world. GDP growth has averaged over 6% over the last 5 years. However, the country also has major problems, including corruption, human rights abuses, grossly unequal distribution of income, and internal religious and tribal conflicts. Based purely on the growth of demand from British Commonwealth collectors, the set represents a conservative investment with little downside risk. Should even a relatively modest base of collectors develop in Nigeria, the set will soar.